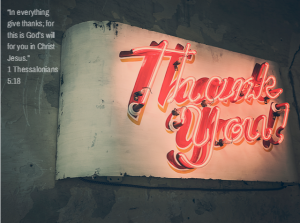 Thank God for letting me be a part of ChristianBlessings blog (through Ms. Evelyn Goh), specifically for the section dedication for Filipino expats/overseas workers. He has given me this another opportunity to share my gift for His kingdom. Another venue to work with God’s people. I am so grateful! Here’s my first post. More to come! What is the first thing you do in the morning? And what is the last thing you do before going to bed? For Christians, I guess it is pretty obvious that we’d mention ‘morning prayer’ and ‘evening prayer’, but the question is, do we really-truly-genuinely-faithfully do it on a daily basis? Regardless of how tiring the day might be or no matter how late we’re running for work or school? 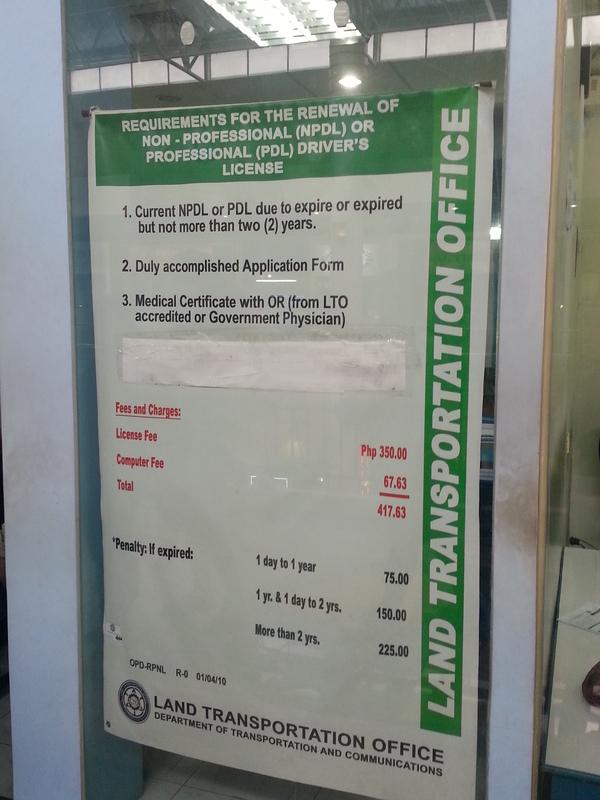 In case you haven’t heard about it, there are LTO Driver’s License Renewal Centers (DLRC) situated at malls. 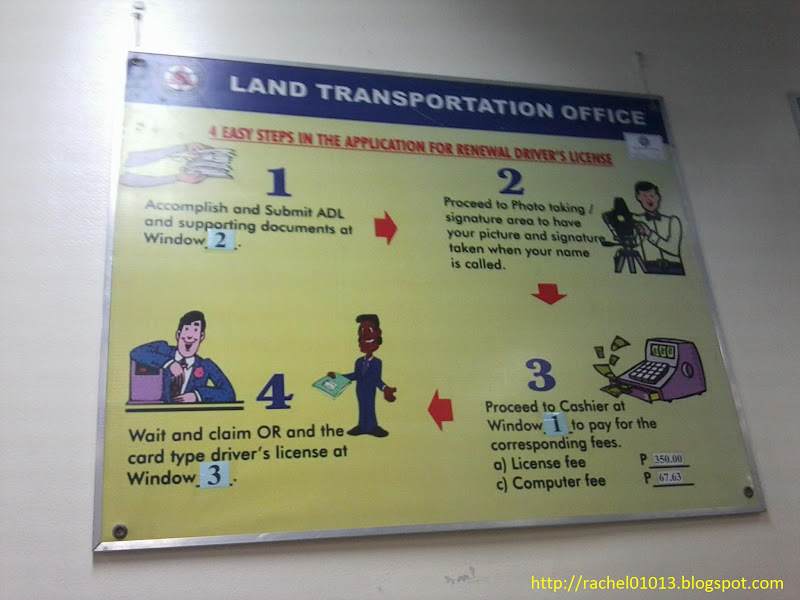 Meaning, if there’s a branch near you, you need not go to LTO main office and suffer in long lines, heat, (you name it), before you get your license. Yesterday, it only took me 45 minutes to get it. Perhaps, if I came in earlier, before the line built up, it would only take me 20-30 minutes. Prepare the right amount for your license renewal. Don’t forget to bring your current license, and your money of course. PHP1000.00 is safe. Step 1. Accomplish application form. You can get a copy at the assistance desk/window which is usually at Window 1. TIP 1: To save time, you can accomplish the application form at home, so you can go straight to medical test at the medical center beside the DLRC. You may download the form here. TIP 2: In case you’ll fill it up at the center, bring your own pen. Step 2. Take the medical test. Pay the fee first (I paid PHP200.00 for this) and wait for your turn. The medical examiner will ask you to step on the weighing scale, read the Snellen Chart (for eye test). He/She shall fill up the rest of the slip, just provide the answers he/she’s asking for (e.g. height, age, civil status). In some centers, there’s urinalysis, so you’d better get your bladder ready. Drug test is no longer required. This is in accordance with the Republic Act No. 10586 or the Anti-Drunk and Drugged Driving Act of 2013, which revokes the compulsory drug testing among driver’s license applicants. TIP: If you have corrective eyeglasses, wear them on when you read the Snellen chart. Step 3. Flash a smile for the cam. Give your medical result and O.R. to Window 1. Wait for your name to be called for the picture taking and signature signing. Remove your glasses if you have. For men who wear earrings, take them off. Step 4. Money down. Wait for your turn to pay for your fee. The standard fee is PHP417.63. If your license has already expired, you have to add the cost of penalty. Step 5. Wait for releasing Your name will be called and you shall be issued your renewed license along with the official receipt. There are some instances when some centers will issue first the O.R. and you will have to go back on a certain date to claim your actual license. There you have it! I got mine at the LTO-DLRC Robinson’s Place Fairview, 3F, Novaliches, Quezon City. A friendly reminder: All renewal centers are subject to Anti-Red Tape Act (ARTA) or R.A. 9485, meaning they should observe “No Noon Break” policy, Anti-Fixer campaign, presence of special lanes for pregnant women, senior citizens, and persons with disability (PWD), no hidden cost, and wearing of readable nameplates/IDs for the frontline personnel, among others. If you observe any violations of this provision, report it to the Civil Service Commission through its Contact center ng Bayan Hotline, 1-6565, or text 0908-8816565, or file a complaint at contactcenterngbayan.gov.ph. DLRC Ever Gotesco, 2/F Gotesco Mall, Commonwealth Ave., Q.C. DLRC Robinson’s Place Fairview, 3F Robinson’s, Novaliches, Q.C. A senior citizen applicant reads the Snellen chart.